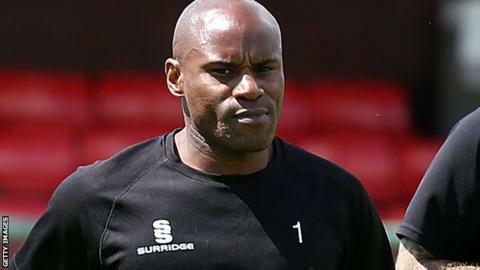 Frank Sinclair has been reappointed as manager of Hednesford Town - less than 48 hours after quitting the job. The 44-year-old former Chelsea, Leicester City and Burnley defender left following Tuesday's 3-0 defeat at Stockport in National League North. But Hednesford chairman Steve Price now says he should not have accepted Sinclair's resignation and asked him to reconsider his decision. Sinclair will be back in charge for Saturday's trip to Gloucester City. "After a great deal of thought over the past two days, I have come to the decision that the kneejerk reaction of accepting Frank Sinclair's resignation on Tuesday evening was the wrong one," said Hednesford chairman Price in a club statement. Former Jamaica international Sinclair is the Pitmen's third manager this season, having taken over in December following the sacking of Bernard McNally after only three months in charge. Former West Bromwich Albion, Shrewsbury and Northern Ireland midfielder McNally took over when Rob Smith left Keys Park to take over at Telford in August. Sinclair has enjoyed just two National League North victories in his 13 matches in charge - both against neighbours Telford - and his team are bottom of the table, three points adrift of safety.